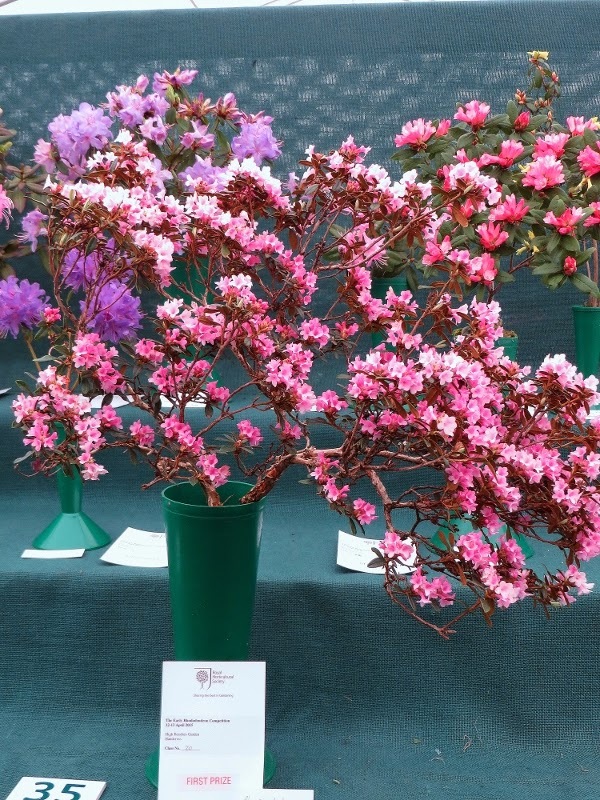 On Saturday High Beeches competed in the early Rhododendron competition at RHS Wisley. A long week of looking for perfect blooms for the show bench bore fruit. On Friday as we were packing the cars with exhibits things did not look good. The larger species Rhododendrons were either marked or going over as were some of the earlier hybrids. Competition was stiff with the Savill Gardens, Exbury, Borde Hill and many others taking part. This made for a very good show. High Beeches gained four firsts for Rhododendrons racemosum, rex, nerriflorum and primuliflorum with many places in other classes. The smaller species rhododendrons saved the day. Rh primuliflorum was voted Best in Show.